Bleasby Tag Rugby Team retain County Champion Title! 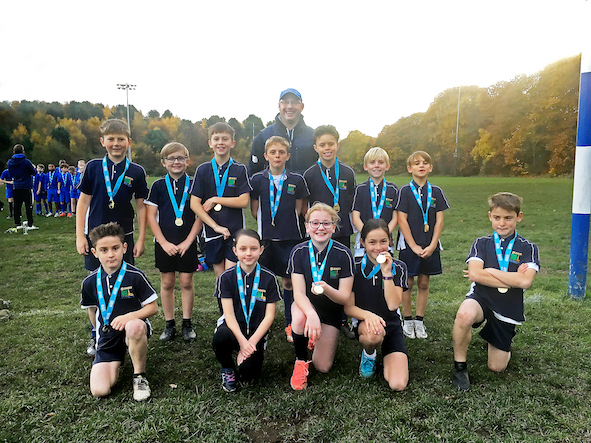 Bleasby Primary School began its bid for the Tag Rugby County Championship when it entered two teams into the Minster and Joseph Whittaker school cluster competition and was delighted to finish in first and second place. Both teams then went through to the Newark & Sherwood District finals held at Newark Rugby Club in October. Bleasby Tigers won all four league matches seeing them take on St Edmunds School from Mansfield. They won the final 5 tries to 3 taking them through to the county finals at Mansfield Rugby Club. Bleasby Lions won 2 lost 1 and drew 1 in the league so finished in fourth place. At the county finals, held on 13th November at Mansfield RFU, the school played eight teams in a round robin competition. School Sports Coordinator Ali Hobson said: "We remained unbeaten all day and played some of the best rugby Bleasby School has played. The fast pace of Daniel Wicks, Seb and Sonny Smith combined with the strong ball handling skills of James Collett, Zac Marshall and Archie Bellamy meant when on attack the team were hard to catch and stop. Incredible defensive skills by Sam Garner, Evie Twomey, Alicia Vickers and Alex Brackenbury kept the opposition teams at bay and the team conceded very few tries throughout the day. The team earned their place as Nottingham County Champions for the second year running! "A massive thank you goes to Mr Robin Scurfield (whose children are former pupils of the school) who has been coming into school to assist Mrs Hobson with the coaching of the teams."